Increasing the locking points in order to protect an up and over door, as we mentioned in the previous blog on multi-point locks, is a way to limit as much as possible the effects produced by a violent attempt to break in. How can you increase the locking points? The 4-way auxiliary deadbolt for up-and-over doors (Item 1.8234.D), with a galvanized steel body and internal components, if used in combination with the multi-point lock, allows the number of locking points to be increased up to 6 or 8. The application of the auxiliary deadbolt on the lower part of the up-and-over door makes it possible to fix additional lock bolts and thereby increase the locking points, also safeguarding the parts furthest from the centre of the door and therefore from the lock. Standard configuration with 6 locking points, with deadbolt stroke at 24 mm. (The stroke is the difference between the position of the retracted bolt and the expanded bolt. 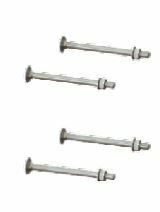 It is important to understand the space necessary to be drilled in the floor and in the wall, so that the lock-bolts can be housed inside them). 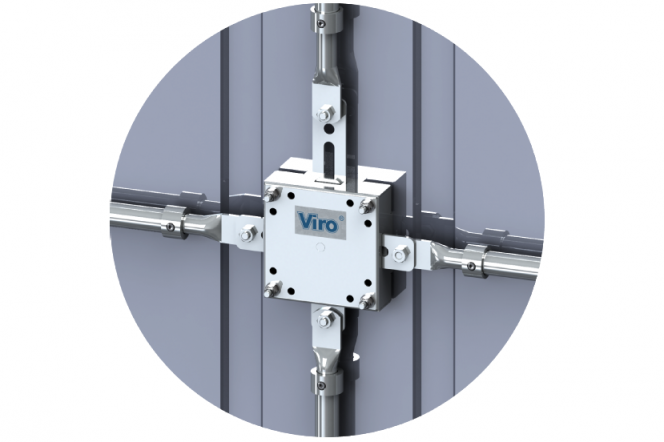 Alternative configuration with 6 locking points, with deadbolt stroke up to a maximum of 40 mm. Alternative configuration with 8 locking points, obtained simply by using two auxiliary deadbolts instead of one. 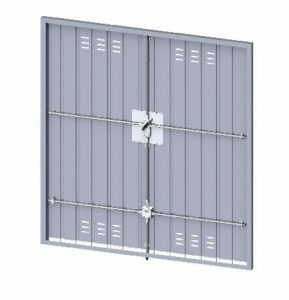 This configuration is advisable for the protection of large garage doors since the greater the dimensions of the door the greater will be the perimeter to be covered. To switch from the standard configuration to the alternative configurations it is sufficient to open the cover of the auxiliary deadbolt and change the position of just the deadbolt at the top, choosing the desired length. How much is it affected by the weight? 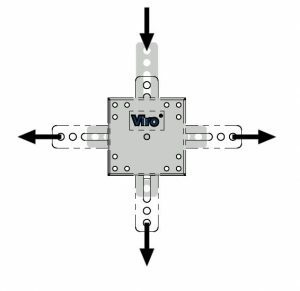 The body of the Viro 4-way auxiliary deadbolt weighs 650 grams. 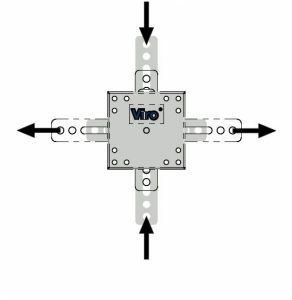 The weight of the accessories, which are applied to the up-and-over door to increase security, takes on a certain degree of importance since the rotation of the up-and-over door is facilitated by a pin and by two concrete blocks acting as counterweights which, supported by two cables, allow you to reduce the weight of the door when opening and closing. When a new accessory of a certain weight is applied to the door a possible counterbalancing of the two concrete blocks may in fact be necessary, proportional to the weight of the additional accessory. The bolts made of casehardened and tempered steel allow the mounting of the auxiliary deadbolt on up-and-over doors up to 30 mm thick. The 10 mm and 13 mm diameter, tubular galvanized steel rods, which can be extended from 42 to 72 cm, supplied with relative accessories, allow the auxiliary deadbolt to be connected to the lock. 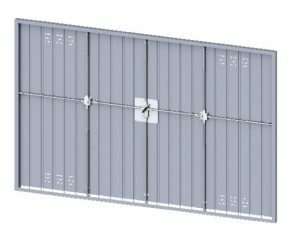 The pair of 15 and 18 mm diameter, tubular galvanized steel telescopic rods, which can be extended from 88 to 165 cm, supplied with relative accessories, allow the up-and-over door to be closed. The standard accessories are: galvanized steel guides and bolts for fixing the guides to the up-and-over door, bolts, nuts and washers for connection to the lock or the auxiliary deadbolt. 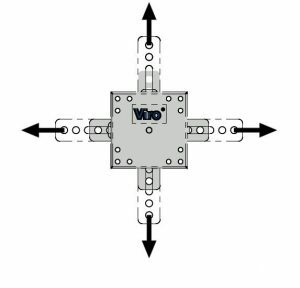 Nickel-plated brass floor striker, which can be adapted to all Viro up-and-over door locks. 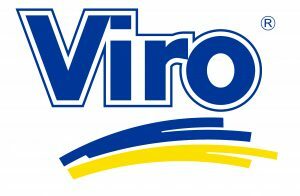 For more information, refer to the Viro website page. This entry was posted in Locks and Cylinders on 20 March 2019 by Miryam Sarti.